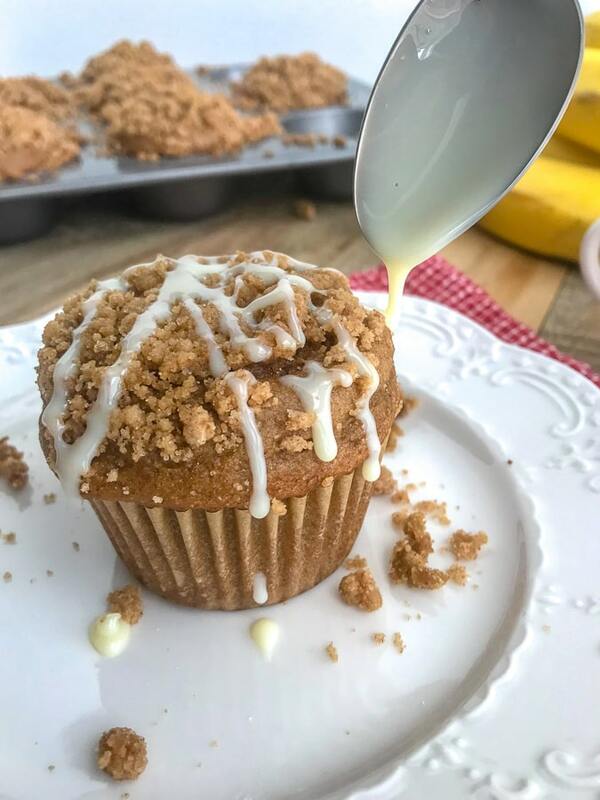 Greek Yogurt Banana Coffee Cake Muffins – the classic coffee cake that we all love transformed into muffin form – made a bit on the healthier side with greek yogurt and bananas! 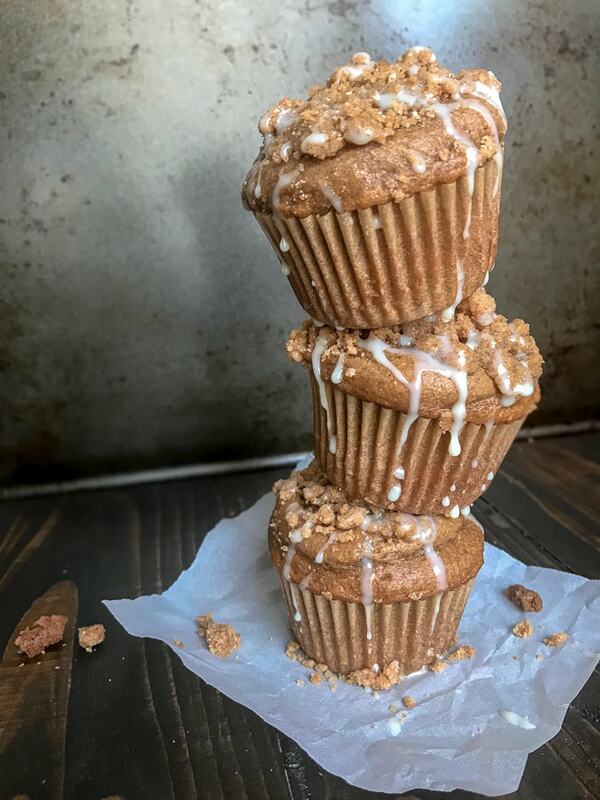 Loaded with the perfect amount of cinnamon streusel crumb topping that offers the perfect crunchy texture contrast to the light and fluffy muffin. 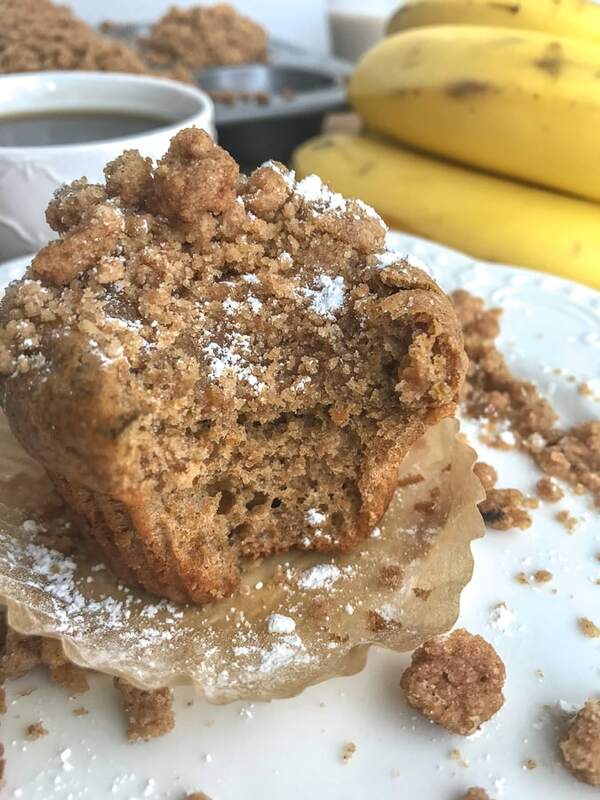 This Greek Yogurt Banana Coffee Cake Muffins recipe is everything a breakfast muffin should be. It’s light, fluffy, and incredibly decadent with a mile-high crunchy topping. I have so many fond memories of coffee cake growing up. It is a dessert that I have always loved. Although, as a child – I never understood why it was called ‘coffee’ cake. Why not Cinnamon Crunch Cake? Or Loaded Cinnamon Cake? Maybe even Perfection Cake? But then as I got older and found my love for coffee – I began to understand why it got its name. Because it’s perfect with a hot cup of coffee in the morning! If I’m going to be completely honest, as a sugar fiend – it’s perfect any time of the day, for any reason, before or after a meal, on the go… you get the point. It’s been awhile since I have made any form of a cake or muffin in this house. I do so for a very important reason. Because, well, I have a difficult time leaving it alone until its completely gone. Sometimes its gone within 48 hours and sometimes, if I am honest with you and myself, it’s gone within 24 hours. When my husband and I first got married, I received this gorgeous cake plate from my stepmom as a wedding gift. This cake plate started my obsession with making a two-layer cake each week. Right now you’re probably thinking I made the cakes just to see the pretty cake plate on my counter. That’s only partially true. I made cakes every week because I couldn’t help myself! But it got to a point where the cakes were disappearing in 1-2 days. This was with the help of my husband mind you! Sometimes I wouldn’t even cut a slice to plate. I would take a fork straight to the cake plate. HA! Clearly this needed to stop. So the baking came to a halt. If anyone has an even worse sweet tooth than me – it’s my husband, Rob. I still think he’s a bit of a child on the inside when it comes to desserts. The concoctions he comes up with! Just the other day he was telling me about “trackside soup”. I mistakenly inquired. Want to know what his little concoction was? Milk with nutter butters and m&m’s – in a cup! HA. Are your eyes bugging out of your head, too? Sounds strange, right? Clearly this concoction came about as those are some of the few sugar-fix items found in the truck at the race track. Thankfully, we do not have anything like that in our house. Otherwise those would disappear just as quickly. So when I make sweets in this house, I try to make them every once in awhile. Our waistlines cannot handle our sweet tooth! 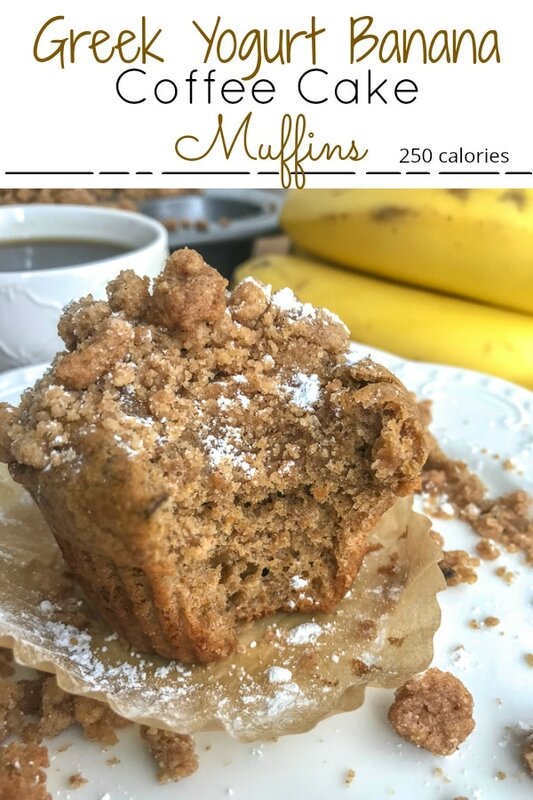 This Greek Yogurt Banana Coffee Cake Muffins recipe was adapted from its sister – the Chocolate Chip Banana Yogurt Muffins recipe that has been a very popular recipe on my blog! And for good reason. If you haven’t made these, then what are you waiting for? 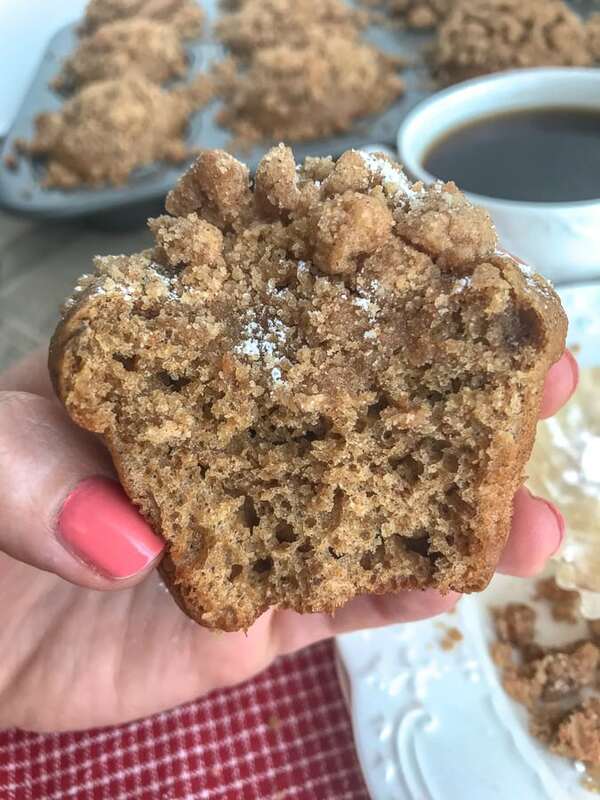 And if you have – you’re going to love these coffee cake muffins!! So let’s get to that recipe, shall we?? I want to start off by saying that if you have not run across these amazing parchment paper liners – then you need to! They are by far my favorite liners as nothing sticks to them. They peel right off, just as they should, without taking any cake of muffin with them. Because we don’t need that kind of sacrifice in our lives, now do we? I don’t know about you, but I am not one that wants to sacrifice part of my cupcake or muffin trying to get that pesky liner to peel off. It seems the healthier you try to make a dessert – the more a liner will stick. Why? Because you’re using less oil or butter than the traditional cupcakes and muffins. 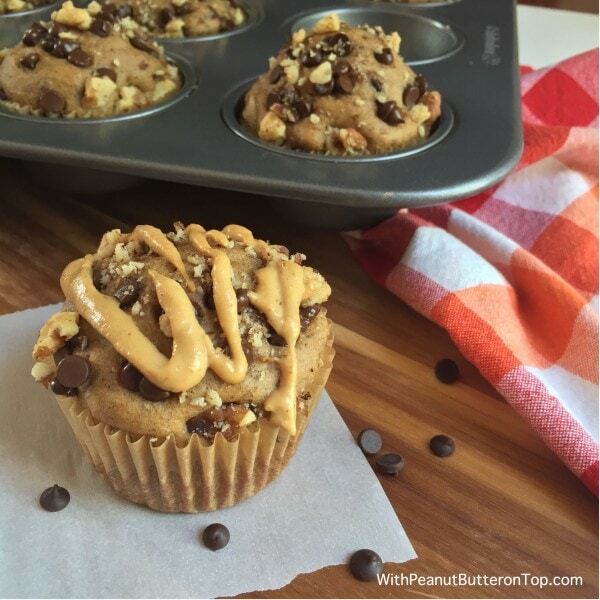 So these parchment paper liners are essential with healthier muffins like these. I have made these a few times and I feel that it is best to allow the muffins to bake for 10 minutes prior to adding the crumb topping. Otherwise the crumb topping seems to sink a little and bake right into the muffin. And that’s not what we want! We want to have the crumb topping to be a sweet, crunchy topping. We want it to compliment the fluffy muffin, not bake into it. 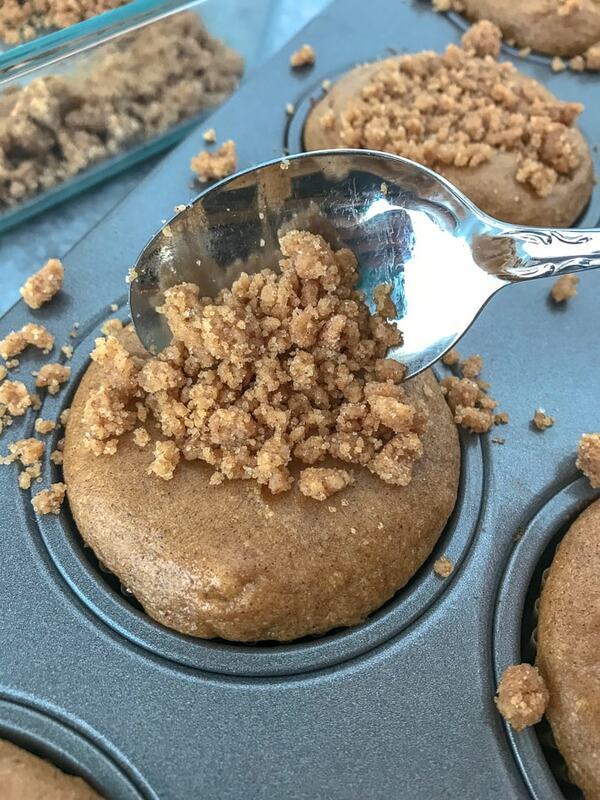 I find that its easiest to spoon the crumb topping over each muffin and then pressing down a tad bit with the back of the spoon to help getting the crumb topping to ‘stick’ or hold. This also helps to cover the entire topping. You want to cover the entire topping! You’re probably looking at your crumb topping as you’re spooning it over each muffin and wondering why you have so much. Keep pressing. Keep covering the tops. I did not reference these with a ‘mile-high topping’ for no reason! You can use your fingers or hands to gently press the crumb topping over the tops of each muffin. It helps that the muffins are partially baked at this point. Pressing with your fingers or the back of a spoon won’t cause a sticky, goopy mess. And if you make a mess with it – quite alright. This recipe gets a bit messy. It’s like a sloppy joe sandwich. You try with all your might to keep the sandwich together, but each bite causes more and more filling to plop right out and onto your plate. That’s how messy making these muffins can be. Some messes are worth it, though. Otherwise we would enjoy those sloppy joe sandwiches or bake such incredibly delicious, crumbly things like these muffins. But don’t stress that the crumb topping will burn or blacken on your muffin tin. It won’t! Did I mention it can be sticky, too? Like a delicious cinnamon roll with icing? YEP. I recommend trying these muffins with either a sprinkle of powdered sugar or a drizzle of sweetened condensed milk. It’s worth the little extra indulgence. I promise! 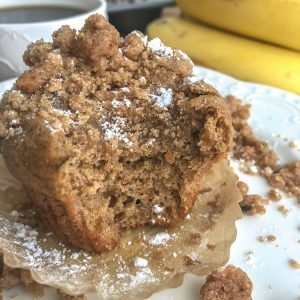 Greek Yogurt Banana Coffee Cake Muffins - the classic coffee cake that we all love transformed into muffin form - made a bit on the healthier side with greek yogurt and banana! Loaded with the perfect amount of cinnamon streusel crumb topping that offers the perfect texture contrast to the light and fluffy base. Preheat oven to 350 degrees F. Line a 12 cup muffin tray with liners. If you're using regular liners, spray with non-stick cooking spray. Otherwise they will stick to the liners due to the lack of oil in the batter. 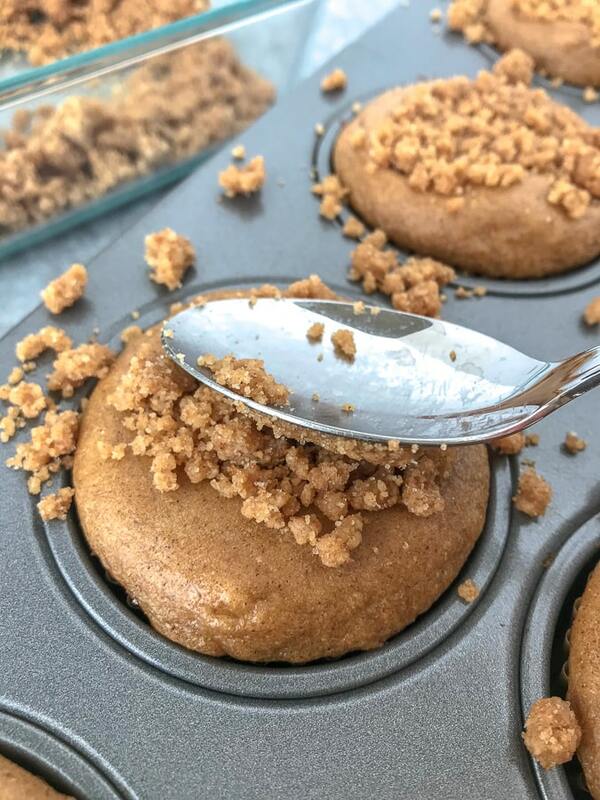 I use parchment baking cups and they work perfectly! 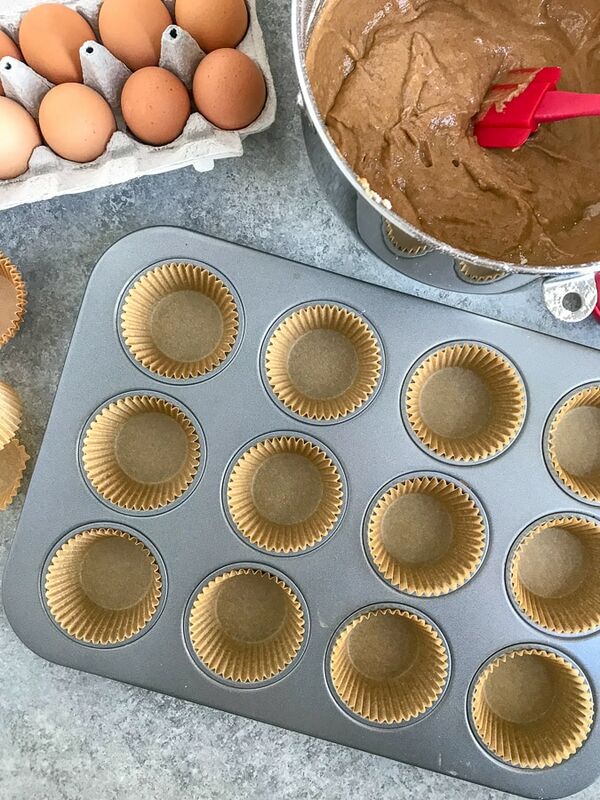 This recipe makes 14 muffins, so if you have a second muffin tin - line it with 2 more liners. In a large bowl, combine banana, sugar, yogurt, vanilla extract and eggs. Mix until bananas have been fully mashed. In a separate bowl, combing remaining dry ingredients - oat flour, ww pastry flour, baking soda, baking powder, cinnamon and salt. Slowly add the dry mixture into the wet mixture, adding 1/2 cup at a time. Using the same measuring cup, add 1/4 cup batter to each muffin cup. Fill the wells 2/3 of the way full. Place the muffins into the oven to bake for 10 minutes. While the muffins are baking, combing ingredients for the streusel topping in a medium-sized mixing bowl. Remove the muffins from the oven, and spoon the mixture over each muffin. Press down firmly, but gently, to coat the entire outside of each muffin. It will seem like you have a lot of filling, but if you press down and cover the entire topping of each muffin, you will have a perfectly crunchy 'mile-high' topping. Place back into the oven to bake for 10-15 minutes, checking at 10 minutes with a toothpick. Toothpick should remove clean from the center. Garnish with either powdered sugar or sweetened condensed milk. Or both! Can be frozen and warmed in the microwave next day for 10-15 seconds max. I am inter in making these delicious muffins but i do not see The directionS. Is there any way you could email them to me? Hey Jennifer! Had a slight issue with the recipe plugin, but they are showing now. Sorry about that!! What are the baking instructik s? Hey Lindsey! Had a slight issue with the recipe plugin, but they are showing now. Sorry about that!! Can I sub extra All-purpose flour instead of whole wheat flour for these muffins?